Join Certified Zentangle® Teacher Rosie Hill at Coos Art Museum on Saturday, May 20, 2017 from 1:30 p.m. to 3:30 p.m. for “Triangle Zentangle” Recently, a new format for Zentangle was introduced: a triangle. Come and use both sides of your brain to figure out how to reformat your tangles to fit the three-sided tiles, called “3Z”. This new format will offer fun, new design opportunities and the challenge of making your tangles move in a different way. We’ll draw tangles to adapt to this triangular shape and create some wonderful Trizengles? Zentringles? However you word it, it’s bound to be fun! 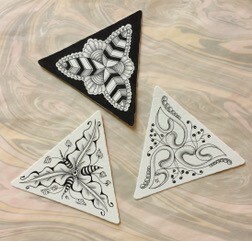 Zentangle experience is not required. Students are required to bring a pencil, black micron pens (01), and tortillion. All other materials are included in class fee. Zentangle books and other supplementary materials will be available for purchase. Teens and adults of all skill levels are welcome. Class size is limited to 12 participants. Class Fee: $30 CAM members / $35 non-members. Registration ends May 20, 2017. For registration go to www.coosart.org or visit Coos Art Museum at 235 Anderson in Downtown Coos Bay.